This sheet mask is available in Korea and Taiwan and not available in Hong Kong. Cucumber contains Vitamin A, B1, B2, C, Chlorophyll, Vitamins and water. It works really well providing a rich water supply to the skin. If you ever feel too dehydrated, the cucumber sheet mask will definitely help recover the loss of moisture on your skin. Mild and gentle, smells really fresh. Suitable for all skin types (even sensitive skin) and it's super hydrating. 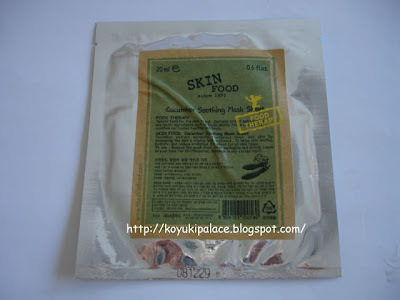 I used it once after I was under the sun for a few hours and my face totally sucked all the moisture out from the mask. It also brings a soothing effect. It even works better if you put it in the fridge being using it to give a cooling effect. Cold mask can also reduce pore sizes.